by Andrew Kliman, author of Reclaiming Marx’s Capital: A refutation of the myth of inconsistency. Figures released today by the U.S. Bureau of Economic Analysis indicate that the U.S. economy remains in the doldrums and that the post-recession expansion seems to be stalling. 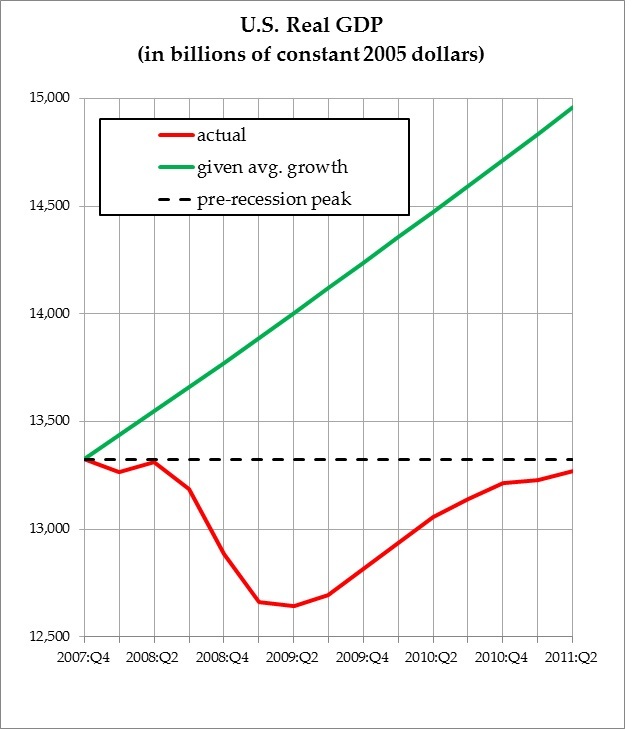 The country’s real Gross Domestic Product (GDP)—a measure of the physical production of goods and services throughout the country’s economy—remains lower than when the Great Recession began, three and a half years ago (see graph).. This is rather shocking news, since we were told six months ago that real GDP had surpassed the pre-recession peak in the last quarter of 2010. But the revised data released today indicate that the recovery that has taken place since the recession “officially” ended two years ago has been much weaker than the unrevised figures had led us to believe. During the March–June quarter, real GDP grew at an annual rate of just 1.3%. That is only about two-fifths of its average growth rate, 3.4%, during the six decades prior to the Great Recession. For the January–March quarter, the Bureau originally reported that real GDP grew at an annual rate of 1.9%, but the revised numbers indicate that it grew by just 0.4%. During the past year, real GDP has grown by just 1.6%, less than half of its average growth rate. In the first couple of years after a recession, GDP typically grows faster than average, so the fact that growth has been much slower than average confirms that this expansion has been much weaker than normal. And it seems to be running out of steam; during the first year after the recession, mid-2009 to mid-2010, real GDP grew by 3.3%. Because the expansion has been so weak, the size of the U.S. economy has shrunk by 11.3% “relative to trend.” In other words, actual real GDP is 11.3% less than what real GDP would have been if it had grown at the average 3.4% rate since the end of 2007 (see graph). The latest figures indicate that this gap has consistently increased for four quarters in a row. The meager growth that has occurred is far too little to put a dent in the country’s massive unemployment problem. As of June, the number of people employed on nonfarm payrolls was still seven million less than at the start of 2008. And more than twelve million extra people would need to be employed today–an additional 9.2%–in order to bring the percentage of people employed back to its pre-recession level. The main immediate causes of the slowdown in the recovery seem to be a slowdown in the growth of business investment and the decline in state and local government spending that has occurred as a result of fiscal crises in many municipalities throughout the country. The longer-term reasons why the recovery wasn’t much of a recovery to begin with have to do with the massive overhang of debt and a persistent decline in U.S. corporations’ rate of profit.